Kristin Leutz in VVM’s new space at Springfield’s Innovation Center. As Valley Venture Mentors completes its move into Springfield’s Innovation Center on Bridge Street, it is also moving into a new era in its history, one that is very entrepreneurial in nature — in keeping with its broad mission — and strives to continually expand and strengthen the region’s ecosystem for supporting and inspiring entrepreneurs. In the startup world, this term has become incredibly versatile, now serving as a verb, a noun, and an adjective. It has become the subject of lectures, books, and articles bearing titles that hint at its emergence — as in “The Art of the Pivot,” “Three Rules for Making a Successful Pivot,” “Five Steps for Pivoting into Entrepreneurship,” and countless others. In simple terms, to pivot means to adapt, or to change the course or strategy of an emerging business based largely on customer wants and needs. Some of the most prominent companies in the world owe their success to a pivot, or several of them. There are various methods of pivoting, as indicated by those article titles above, but the bottom line — both literally and figuratively — is for entrepreneurs to understand the importance of flexibility and the need to pivot, and to not be afraid to so. 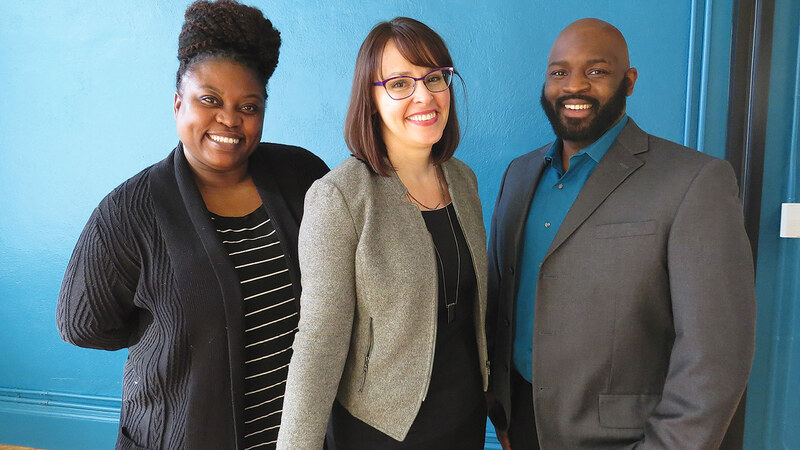 Administrators and mentors at Valley Venture Mentors (VVM) have been preaching the need to pivot and showing people how since the nonprofit was launched eight years ago now. And these days, one might say it is practicing what it’s been preaching. What VVM is engaged in now could be called a pivot, although its overall mission and strategy are not really changing. They are evolving, though, and being taken to a new and higher level as the organization completes its move into the long-anticipated, $7 million Innovation Center on Bridge Street in downtown Springfield. The move began last summer, said Kristin Leutz, who assumed the role of CEO at VVM about the same time as the moving trucks started unpacking furniture. And it is ongoing, she said, as new furnishings arrive and new strategies emerge for making the best and most efficient use of the intriguing 10,000 square feet of space VVM now commands. The agency will be using a small percentage of that space for its own administrative needs, with the rest devoted to revenue-producing, entrepreneurial-ecosystem-building endeavors, from signing on tenants for various co-working spaces and small offices to renting out the large, 175-seat auditorium that dominates the ground floor of VVM’s suite. And this is where the pivoting comes in, said Leutz, adding that VVM is moving to a slightly adjusted, more entrepreneurial model, necessitated by the need to cover the expenses of what is, in many respects, a growing business in its own right. These include the nearly $4,000 in monthly rent — a great bargain given the amount of space and the going rates downtown these days — as well as a growing staff and the myriad other costs of running such an operation. From left, Stephanie Kirby, VVM’s director of Mentorship; Kristin Leutz, CEO; and Ron Molina-Brantley, COO. “This space represents a micro entrepreneurship venture of our own,” she explained, adding that, like the startups mentored and supported by VVM, it has a business plan and a strategy for executing it. In simple terms, it involves making the Innovation Center not merely a revenue center, although it will become that as well, but an entrepreneurial hub and a place where collisions can and will happen — collisions between fellow entrepreneurs, business owners and mentors, entrepreneurs and potential investors, and more. Summings things up, Leutz noted VVM’s working slogan (“Give. Get. Grow.”) and said the new location and all its facilities — from different kinds of co-working space to a nursing room for new mothers; from a shared kitchen to areas where startups and mentors can meet and collaborate — provide individuals, startups, and the entrepreneurial ecosystem as a whole with more opportunities to do all of the above. For this issue, BusinessWest talked with the staff at VVM about not only the move into the Innovation Center, but the organization’s pivoting action and the next crucial steps in its history. 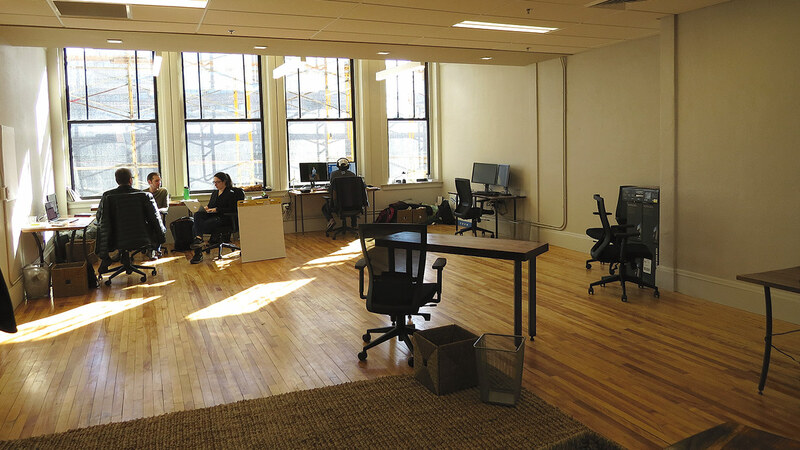 VVM will stage a grand-opening ceremony at its new space on Thursday, Feb. 7, when it co-hosts the annual State of Entrepreneurship Conference with the Economic Development Council of Western Mass. The invite list for that event, and the ribbon cutting to follow, is rather lengthy, said Leutz, noting that it includes representatives of a number of entrepreneurial ecosystem partners — from the Grinspoon Foundation to TechSpring to area colleges and universities — as well as a number of other constituencies, including elected officials, VVM alums, mentors, and long-time supporters. “We’re checking our occupancy level to see how many we can have in here legally,” she said, adding that the agency will test the upper limit of that number, whatever it is. Getting to this ribbon-cutting ceremony has been an adventure, she noted, and a long journey that started when she and many other representatives of this region toured the Cambridge Innovation Center and came back determined to create a similar place-making facility in this region, preferably in downtown Springfield. Fast-forwarding somewhat — this story has been well-chronicled — the historic structure at 270-276 Bridge St. was eventually chosen, and a number of funding partners, including MassDevelopment, MassMutual, Common Capital, and others, were secured. The project got underway in 2017, but as work proceeded and walls were taken down, it became clear that the cost of the work would far exceed preliminary estimates — and the amount raised. Work was stopped for several months before eventually starting up again last spring. Leutz recalled the occasion. But as work was starting up again, VVM was going through a transformation of its own, starting at the top, where Leutz, who joined the organization as COO in the fall of 2017, was chosen to succeed Liz Roberts as CEO. “I’ve always been a big fan of VVM,” said Leutz, who was a mentor with the organization in its earliest days and is perhaps best-known locally for the decade she spent as vice president for Philanthropic Services at the Community Foundation of Western Massachusetts. And now that it has, she and fellow team members take on the assignment of plotting an ambitious course — and keeping it on the course, again, much like the startup businesses it helps mentor, she said, adding that when she came on board as COO it was to essentially help blueprint a new strategic plan for the nonprofit centered on its home and the new opportunities it offered, and she was intrigued by the assignment. As was Ron Molina-Brantley, who joined VVM a few months before Leutz did and would eventually succeed her as COO. Formerly an employee of the city of Springfield, working first in the Finance Department and then the Facilities Department as senior program manager — a perfect blend of skills for an organization moving into new space and also assuming new fiscal responsibilities — Molina-Brantley said he was looking to grow professionally, and VVM and the next stage in its development offered an intriguing challenge. 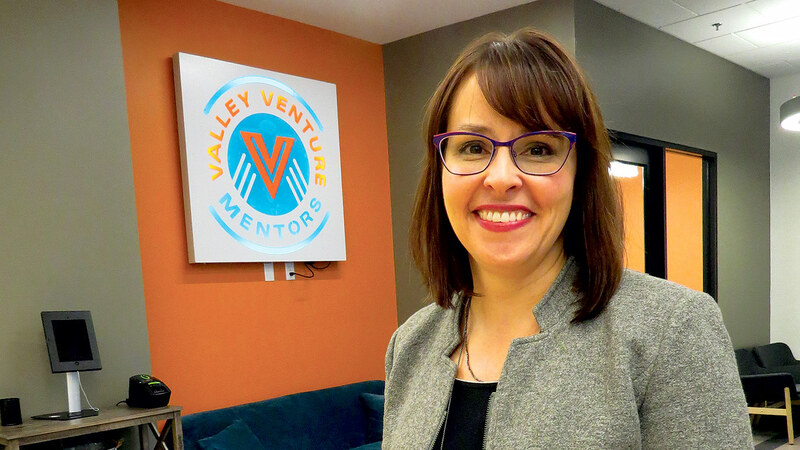 It was, and is, for Stephanie Kirby, as well, VVM’s director of Mentorship. An alum of the agency’s collegiate accelerator program, she started her own business (a music label) at age 14, and has continually honed and reshaped it over the years — so much so that she was known as the “pivot queen” when she took part in VVM’s first collegiate accelerator while attending Five Towns College in New York. “I would pivot a lot within my business, and when you come to VVM, that’s what they teach you — how do you actually build your business,” she said, adding that she’s now working to help others master that skill. Together, these and other team members have taken on the assignment of moving VVM into a new era, if you will, one that poses some challenges for the agency, but myriad new opportunities for entrepreneurs and those mentoring them — and for strengthening the entrepreneurial ecosystem the region has built and that has gained considerable momentum in recent years. To explain it in simple terms, Leutz said the VVM operation is in some ways similar in structure to a pyramid. At the base is the place — in this case, the Innovation Center — where things, meaning those collisions she mentioned, can happen. The next level in the pyramid is programming, which at VVM means mentorship and acceleration, specifically its two popular accelerator programs — a startup accelerator and a collegiate accelerator. And the top of the pyramid is what she called “an ecosystem builder,” meaning systems to support what others across the region, like the Grinspoon Foundation and the area’s colleges and universities, are doing. VVM’s mentorship lounge, top, and the shared community kitchen are just some of the spaces carefully designed to promote collisions. And the Innovation Center and VVM’s new facilities are designed to help make that vision reality, she went on as she offered a tour that started on the ground floor, devoted to programming, and the auditorium, which is community space in every sense of that phrase. “We encourage anyone and everyone to think about how to promote entrepreneurship in their industry, their business, or their community, and come talk to us, and we’ll make this space available,” she said, adding that the space was essentially created to showcase people’s ideas and their notion of entrepreneurship. 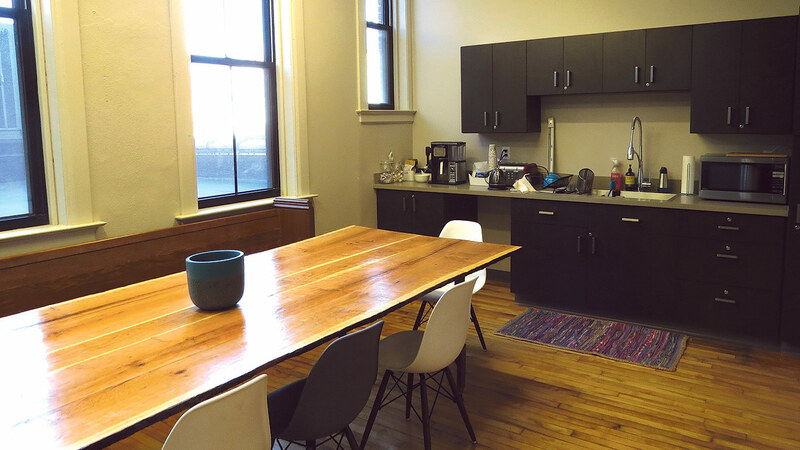 It also includes two private offices that can be rented out and café space as well. The second floor, what she called the “beating heart of our startup community,” is where the co-working space is to be found. Half of the floor is dedicated to people who rent permanent spots on a month-to-month basis, she said, adding that three startups are currently doing so. 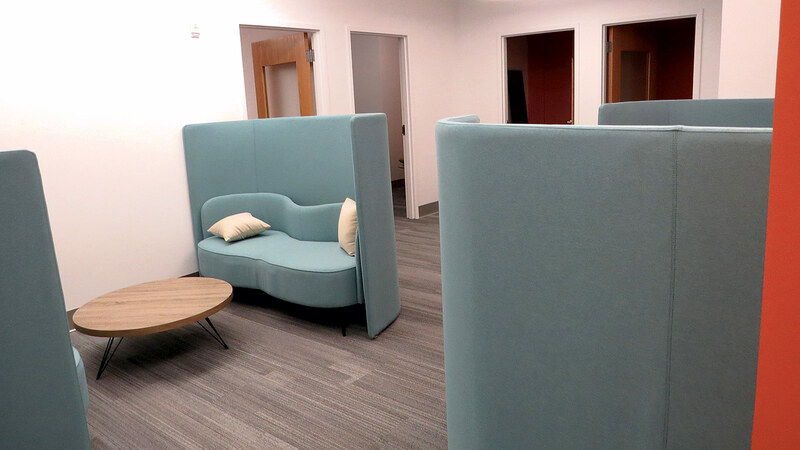 There’s also the so-called ‘hot desk’ space — unassigned space that be rented for $25 a day, with other rates for more regular use — as well as a ‘brainstorming nook,’ a community kitchen, private phone rooms for entrepreneurs seeking some privacy, the private room for nursing mothers, and more. Roughly 50% of the space that can be rented is now under lease, she said, adding that the goal is to get that number to 75% and perhaps 100% by the end of this year. Describing the look and feel of VVM’s new home, Leutz noted that, while these spaces may have been inspired by similar facilities in other communities, they don’t look like those spaces. Summing up what’s been created on Bridge Street, Leutz went back to the goals put down on paper after the group visiting the Cambridge Innovation Center returned to Springfield and set about replicating what they encountered. “This intention of this project was always to have it be a community-driven space focusing on the innovation economy and enlivening the economic activity downtown,” she said, adding that this is a broad mission, and, as noted, somewhat of a pivot for VVM. An exciting pivot, for sure, and one that certainly bears watching in the months and years to come.